1. The treatments for the mind, body and soul will leave you feeling rejuvenated, pampered and with a sense of well-being only a spa can bring. Let the experienced therapists work their magic once and you will find ‘just one more’ treatment an absolute must. 2. Set in sublime surroundings, Tamara Spa has beautifully designed treatment rooms where couples can enjoy their spa experience together. 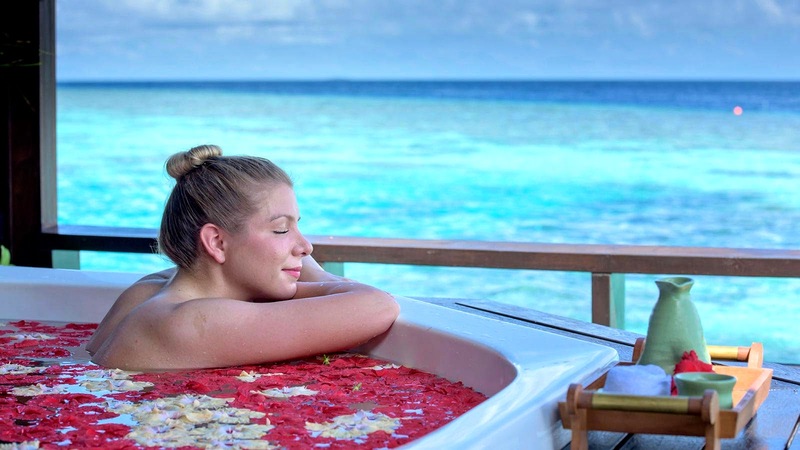 An outdoor jacuzzi strewn with petals and overlooking the ocean makes this a setting you will not forget. The views during the treatment, through the glass floor, allow you to lose yourself in the calmness of the ocean and partake in a little fish spotting too – all whilst enjoying the treatment. 2. World-class products including the Elemis range are used to bring results with a touch of luxury. Science and beauty meet to bring treatments that soothe not only the body but the mind too. Elemis products are also available to purchase so you can take a little piece of the Tamara Spa experience home with you too. Put Tamara Spa on your list of Lily must dos and you’ll be repeating the experience as often as you can! If someone you know will be visiting Lily Beach Resort & Spa, why not surprise them with a Lily Gift of a Spa Voucher to use during their stay? Or simply treat yourself by booking in advance! Tamara Spa by Mandara has been nominated in the World Luxury Spa awards and voting is currently taking place. There’s still time to cast your vote.